ExpressVPN is an advanced VPN product with lot of features and yet simple user interface. Variety of server locations is great (94 countries) and it will work fine with Netflix, HBO GO and other streaming sites. On the other hand ExpressVPN is quite expensive compared with other products ($12.95 / month). There is no free trial available, but you have 30 days to return the product and get full refund. ExpressVPN is one of the most popular VPN products on the market. It was first introduced to the market in 2009 (at least that’s what we were able to find). A product for Windows, it is extremely light, fast, and easy to use. It has also some advanced features like 4096-bit CA encryption, server locations in 94 countries, multi-platform licensing, and is capable of handling simultaneous connections on up to 3 devices. The product update 6.6.1 from May 2018 brings two new features – Split Tunneling and DNS Leak Protection. The company is strictly focusing on VPN products and they have a very broad range of them from typical Windows, MacOS to Linux, or even VPNs for your router. ExpressVPN is also quite pricey. The 1-month license starts at $12.95 and the 1-year license at $99.95. But the license is multi-platform and you can use it with all sorts of different devices. There is no free trial version. ExpressVPN is the top-notch product with both a great user experience and advanced features. But the price you will pay is quite expensive. See the detailed features overview at the end of our review. Pricing & Discounts – How much does ExpressVPN cost? ExpressVPN price starts at $12.95 per month, but you can save 35% by going with the 1-year plan which is $99.95 (e.g. $8.32 per month). There is currently a promotion on the ExpressVPN website, but it looks like it’s been there for a long time. Checkout itself doesn’t even have a field for a coupon code, so we assume there are none available. Unfortunately, ExpressVPN doesn’t offer any kind of free trial version. The only way to try before buying is by getting the regular license and refunding it within the 30-day money-back guarantee period. User Interface – Is Avast ExpressVPN easy to use? ExpressVPN is one of the cleanest and easiest to use VPN products we have tested. Even if you are a beginner user, you will understand how to connect. There is just a big turn on button and the server is chosen automatically based on your location. 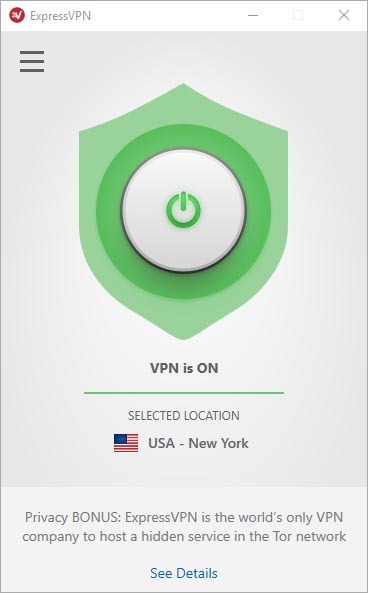 Although the product looks really simple it offers some advanced customizations like selecting a VPN protocol, the choice of using ExpressVPN DNS servers when connected, enabling kill switch, and automatic connection on system startup. The only annoying thing about the user interface is the server location. If you want to select the location from the drop-down menu (see the picture below), you need to click on the small arrow. If you click on the location, it will start connecting immediately. 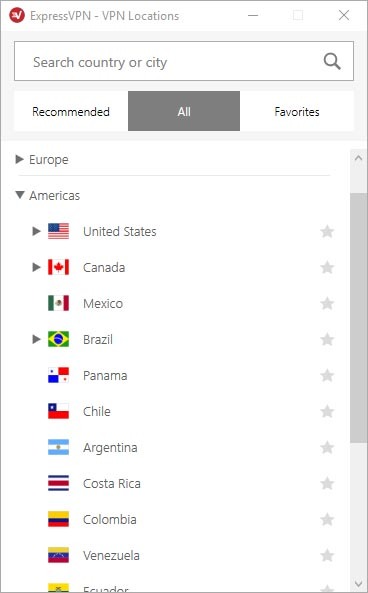 Besides simple user interface and advanced features, ExpressVPN also offers quite an extensive choice of server locations. You can connect to 145 cities in 94 countries. There is even a VPN server in Bhutan! Unfortunately, China has banned usage of ExpressVPN products, so they are currently not available on the Chinese App Store or Google Play. This is a really comprehensive list and you can find almost every location in the world on it. Some of them also feature virtual servers to support even faster and more secure connections. However, it’s not exactly clear which locations support anonymous peer-to-peer connections. Does ExpressVPN Support YouTube, Netflix, Hulu, HBO GO, Amazon Prime, & BBC iPlayer? During our testing, ExpressVPN worked well with YouTube, Netflix, Hulu, HBO GO, Amazon Prime, Google, and Facebook. We have used various US server locations. However, it didn’t work with BBC iPlayer which requires a UK location. We tried Berkshire, Kent, and London and it didn’t work from any. It looks like BBC iPlayer is automatically blocking all VPN accesses. ExpressVPN seems to be quite unreliable and inconsistent when it comes to speeds. 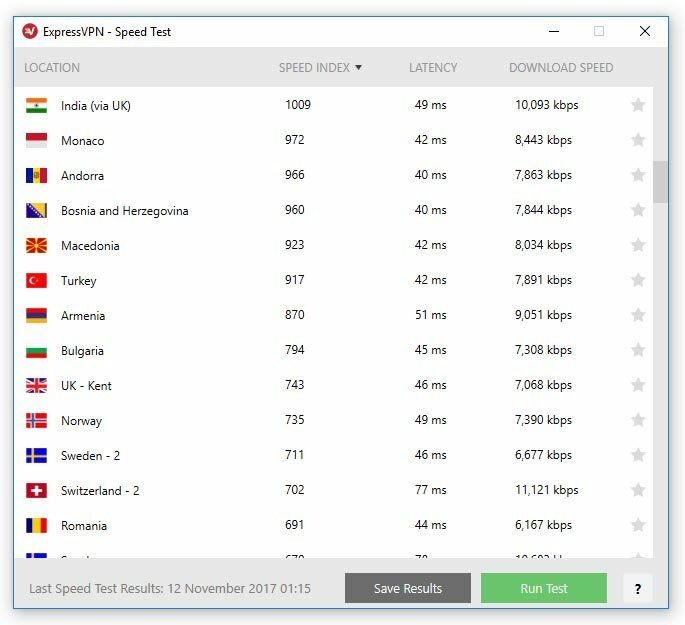 While a connection to some servers (Germany, United Kingdom) is really fast and there is only around a 20% loss in download speed, there are server locations (Australia, Brazil, Russia) where the loss is more than 50%. As you can see in the results table below, the benchmark with no VPN used was 56 ms ping, 15.29 Mbps download, and 4.71 Mbps upload. The speed, when connected to one of the ExpressVPN servers, varied from only 1.54 Mbps download in Australia to 12.66 Mbps in Germany. For testing, we have used free web service by Ookla. ExpressVPN also has its own built-in speed test. Run the test (menu » speed test) to see which locations are fastest and use them when selecting a server location. ExpressVPN provides a very good level of customer support, no matter if you have already bought the product or if you are just a regular site visitor. Probably the best channel is the free online live chat which is available from the bottom-right corner when you are visiting the site. You can ask pretty much all types of questions from technical ones to sales ones. Unfortunately, there is no phone number you can call. 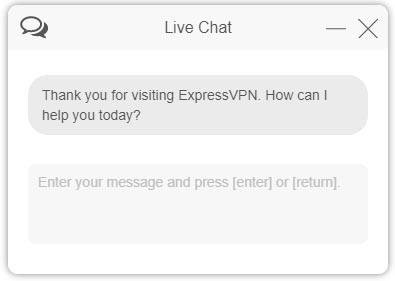 According to their FAQs, ExpressVPN doesn’t store activity logs or connection logs of their users. What is great is that ExpressVPN is legally based in the British Virgin Islands (British Overseas Territory) where the law affords more privacy and anonymity than U.S. or European law. However, it’s not clear where the ExpressVPN headquarters is or who is on their team. There is also no physical address or career offerings. Why? Are they hiding something? Conclusion – Is ExpressVPN worth $12.95 per month? ExpressVPN is a great product with advanced features and rich server locations coverage. However, it’s also a bit pricey and performance in some locations is pretty bad. We recommend investing in the license if you are planning to use it on more of your devices (like a laptop, mobile, tablet) because there is no incremental cost for that. But for a higher price, you will get awesome coverage, a very high level of privacy (ExpressVPN is registered at the British Virgin Islands), and advanced features like the kill switch, split tunneling, DNS leak protection, built-in speed testing, protocol selection etc. If you are not sure whether ExpressVPN is the right product for you, take advantage of their generous 30-day money-back guarantee. Hi. The ExpressVPN phone apps have no kill switch.